About the Campaign | Stop Samsung - No More Deaths! 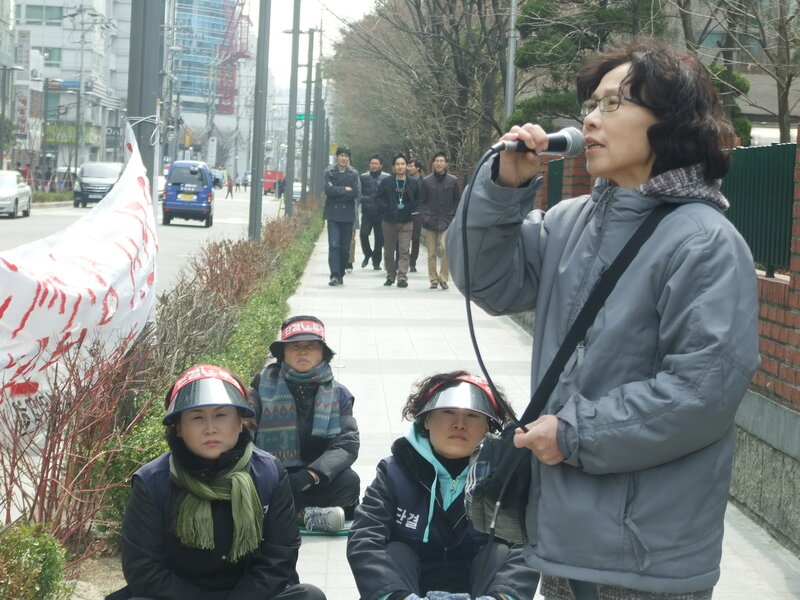 On 23 June, the final decision of the Seoul Administrative court on the lawsuit raised by five blood cancer victims in Samsung semiconductor factories in South Korea was announced. 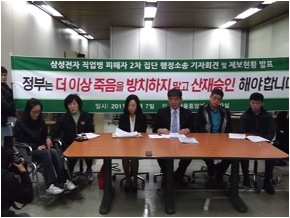 The judge concluded that two cases of leukemia in workers who had been operators in Giheung factory, Hwang Yumi and Lee Sookyoung, can be regarded as related to the working conditions, even though there is no concrete evidence of expsure to carcinogen. And the judge accepted almost all the arguments of the plaintiffs on the work-relatedness. So we, SHARPs, welcome this decision of the court, but we cannot but emphasize the limitation of it. The explanation of the court on their decision of not accepting the other three cases as occupational diseases still show a kind of serious limitation. We will point those things out clearly as soon as possible when we get the document of final decision, and continue to fight to overcome those limitations for the right of workers. Please share this good news with many people, and send some soludarity message to us, the victims and the activists of SHARPs, who decided to fight together until all the victims can achieve their right to their health! SEOUL, June 23 (Yonhap) — A Seoul court ordered compensation for the families of two young Samsung Electronics employees who died of leukemia, recognizing for the first time a link between leukemia and working in a computer chip-making line. 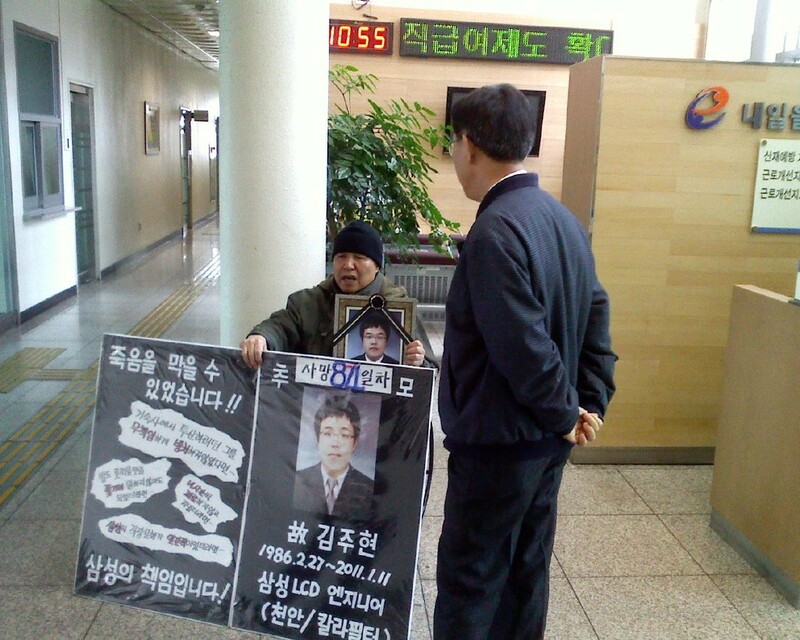 The Seoul Administrative Court ruled in favor of the families, who requested the court annul the Korea Workers’ Compensation & Welfare Services’ 2009 decision not to pay compensation and funeral expenses for the deaths. The state-run worker welfare agency delivered the decision, refusing to acknowledge their deaths as workplace disasters. 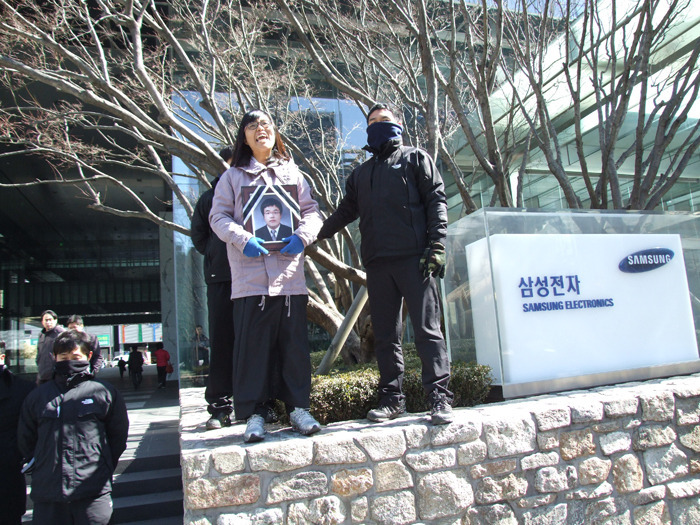 The latest ruling reversed the agency’s decision, acknowledging the influence of the working conditions at Samsung Electronics on the workers’ deaths. 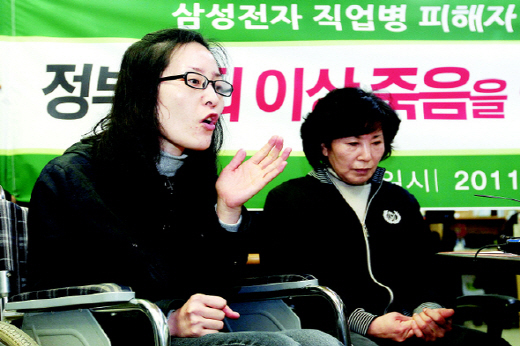 One of the two female workers, surnamed Hwang, died in 2007 at the age of 22 due to acute myeloid leukemia after being diagnosed with the illness in 2005 following her two years of work at a production line, based in Gyeonggi Province, for wafers used to make semiconductors. The second employee, surnamed Lee, had a 10-year career at the same factory before dying of the same type of leukemia in 2006 at the age of 30. “Given that they carried out cleaning duties on unautomated production facilities at the most worn-out place of the No. 3 bay of the No. 3 line, they seemed to have been exposed to a greater influence of toxic materials,” the judge panel said, referring to the same spot they both worked at. Similar lawsuits against the agency and the company are expected to follow the court decision, which is the first to tie working conditions at the world’s largest memory chip maker to employee deaths. Meanwhile, the administrative court dismissed three similar requests by the family of another dead worker and two former employees, each suffering from lymphoma and leukemia. The court did not acknowledge the work-illness link in the cases of the two ailing people and the husband of the dead woman, who all worked at different production lines. Samsung, which has strongly denied that its production lines pose risks of cancers, refused to accept the Seoul court’s ruling. He added that Samsung will announce this summer the result of a one-year investigation of semiconductor lines that’s currently under way by a group of overseas experts. Korean people like the number “three”. In Korea, when we fail or are disappointed, we encourage ourselves quoting a common saying “don’t give up until the third trial”. The funeral usually takes three days. Even though I don’t know the exact historical base, but we feel the “three” as a complete, comfortable number. However, today is the ninetieth day from Joohyun’s death. He was twenty-five years old when he entered Samsung LCD as an engineer. His family still remembers how much he was happy to be a “Samsung-man”. But Joohyun’s dream was totally destroyed. Joohyun had suffered from skin disease due to chemicals which he could not know even the names of. So he had to move from the production line into a material supplying department. But as before, he had to work more than 12 hours a day. He had to go to work whenever he got a call, even on holidays. Also he was totally isolated in his dormitory. There was no one with whom he could talk about because all the room mates had different work shift schedules. Moreover, more than three hundreds of cameras were watching everywhere to prevent workers assemblying. During the sick leave for two months, he looked to overcome his illness. But as the day to return to work was coming, he became irritable and anxious again. A few days before the end of his sick leave, Joohyun visited the company to get counseling. After coming back from the company, he told his family that he should return to work, in the production line again. There was no other choice but to return to work – if he refused, he must quit his job. The day was the first day of returning to work. Joohyun couldn’t sleep at all. He wandered here and there in the dormitory, and all his activities were recorded by hundreds cameras – even his four attempts to jump to his death. Joohyun’s family have been demanding Samsung to apologize and take responsible action, because both Joohyun’s depression and death were not just individual problems. So the family asked the local office of Ministry of Labor to investigate Joohyun’s working conditions, and to the police to investigate what had happened on the very day of Joohyun’s death. At first, the response from both governmental organizations were the same: silence and ignorance. To tell a long story briefly, it took 90 days for them to do what they must do. 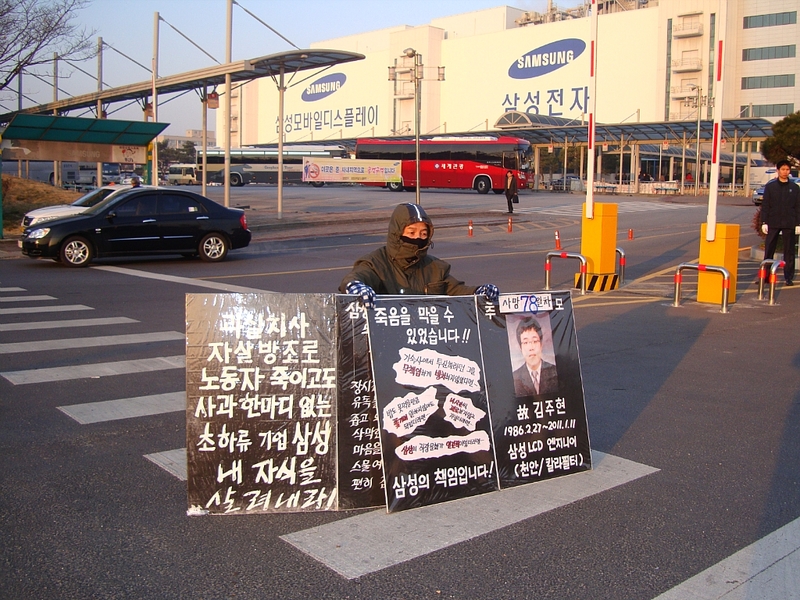 Recently, the local office of MOL have found a few illegal practices of Samsung, a small but clear evidence that can show the working conditions in Samsung plants are not different from that of a sweatshop. Finally, they will send the documents to the public prosecution office tomorrow. April 20 will be the 100th day from Joohyun’s death. Let’s demand Samsung to get responsibility. 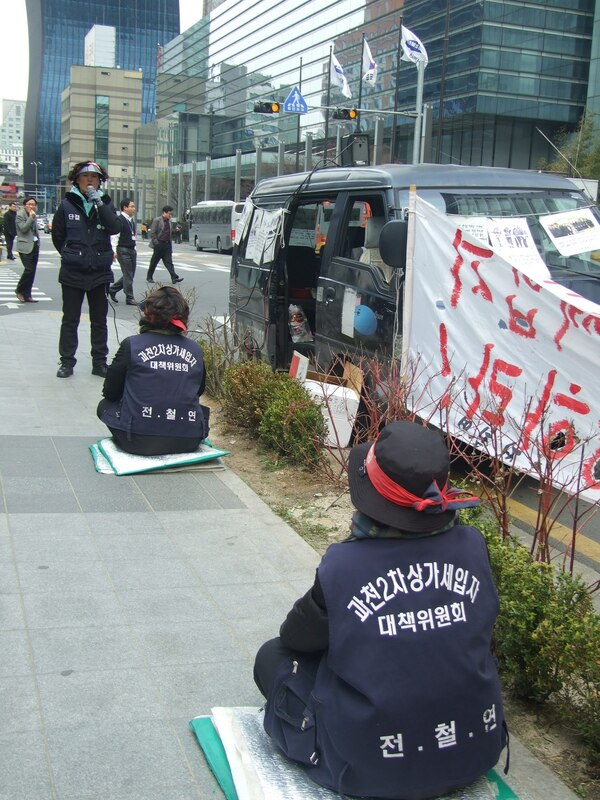 Let’s demand the Korean government to do their duty to watch the company and to punish its illegal practice. Let’s add our voices to this lonely struggle of family who lost their youngest one. Please think and act whatever you can add your voices to this struggle before the 100th day is coming. Justice for all can’t be achieved without justice for the weakest people. 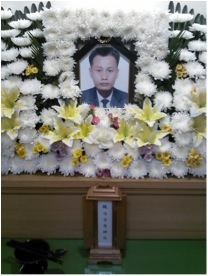 For an earlier account of the suicide and later struggles of Joohyun’s family, see this previous post.